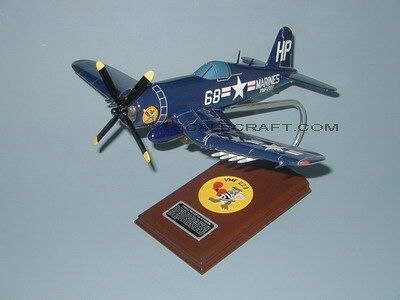 The F4U-4 arrived late in WWII, and served only during the last four months of the conflict. The battle test for the F4U-4 was the Korean War. Here the type served mainly as a fighter-bomber, but nevertheless one pilot, Capt. J. Folmar of VMA-312, was credited with shooting down a MiG-15. Mahogany Wood. Scale: 1/32. Wingspan 16 1/4 inches, Length 12 1/4 inches.